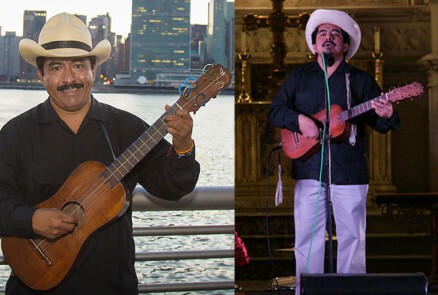 Zenen Zeferino is a jarana player and improvisational poet from Veracruz, Mexico who has been a pioneering force in Son Jarocho music for the last thirty years. Born in Jáltipan de Morelos, Veracruz, he was a founding member of the legendary group Chuchumbé in the 1990’s and later Quemayama His current is Zenen Zeferino y el Sonoro Sueño. Zenen is known for pushing the boundaries of tradition, mixing Afro-Mexican rhythms with other styles. Zenen will be joined by Radio Jarocho who play son jarocho music fashioned after the towns, musicians and swampy countryside that created it in Veracruz, Mexico. A fusion of indigenous, Spanish, and African musical elements, son jarocho reflects the population that evolved in the region from Spanish colonial times. The band writes their own songs inspired by this popular genre and adds their own influences to create a contemporary repertoire that captures the spirit of the traditional style. The accompanying rhythmic dance is an integral part of the tradition.